Laundry Room Goals: The LG Twin Wash System Brings Me Joy! Doing laundry is therapeutic for me. There’s something very zen about restoring clothes to cleanliness and starting fresh. The swishing of the soapy water, the hum of the machines, the rumble of the spin cycle and the smell of fabric softener, oh, so good! I also get this feeling every time I wash my hair but that’s a story for another day. Today, we’re talking about the super fancy LG Twin Wash System, an LG Front Load Washer and Sidekick Pedestal Washer all in one. It’s a laundry lover’s dream. Yes, there are laundry lovers out there and we have laundry room goals! My current washer is an old school, ho-hum top-load washer that robs me of the joy of seeing my clothes swish around in soapy water. Yes, I said joy! That’s one of the reasons I would love to upgrade to the LG Twin Wash system. It’s a large capacity LG Front Load Washer (that would allow me to see inside) paired with the LG SideKick Pedestal Washer that allows you to wash two loads at once. The other reason I would love a laundry solution like this is the pedestal washer is designed for smaller loads. This nifty nugget is great for when I have only a few items that need to be washed right away. I don’t like to run my machine unless it’s full because, you know, energy saving, but with the SideKick, I wouldn’t have to worry about it. I can’t tell you how many times I’ve had to forego wearing a favorite pair of jeans because they weren’t clean and I refused to do a tiny wash before my major wash day. Grrr! Front-load design gives a thorough clean without agitation. This is better for the life and look of your clothes. Save time by washing two loads of varying sizes at once. Save resources and energy by washing small loads in the smaller machine. Various cycles and temperature settings give you the perfect wash environment for each item. 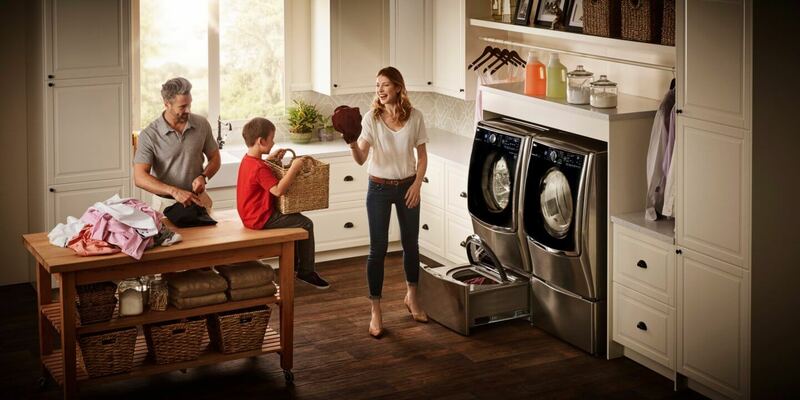 LG TwinWash Front Load Washer and SideKick Pedestal Washer for easy, efficient laundry days. LG washers are energy efficient, offer superior cleaning performance and can handle loads of all sizes. It’s no wonder LG is chosen most over other brands! With a Twin Wash System by LG, I’d be well on my way to laundry room goals. How about you, my lovely? Do you have laundry room goals? Just me? Okay. Carry on! This shop has been compensated in the form of a Best Buy Gift Card and/or received the product for a reduced price or for free. This is amazing!! I am not a fan of doing laundry, this would cut my laundry time in half! I also hate when I only have a few things to wash. I feel it’s a waste to wash a handful of clothes, but with this, I feel it would be a whole different story! Exactly! I could be a real Suzy Homemaker with this puppy! It’s funny the things that are exciting once you become a mom lol. I finally got a new washer and dryer and I love watching my clothes wash.
Oh man, I need that small washing area! With two small boys, there always seems to be something that needs to be washed but I also hate to do it when it’s not a full load. Yes, there’s always something that needs to go in right now. Total lifesaver. I have seen this washing machine advertised and now I know more, I want one! I like that you can wash small loads and it looks so nice. I would die for my laundry room to look like this! I have my washer/dryer stacked with no room! This is amazing, it would really save a lot of time . I’m not really fan of laundries but this is amazing idea. Old school washers still good though! So I have been interested in these but do they cause a smell to the clothes? When I lived in Ireland we had a front loading machine and the clothing always had a weird smell for some reason. That’s odd. I haven’t heard reports about a weird smell from front loading machines but I have heard about problems with the high efficiency machines when people use the wrong detergent with them. I’ll keep an eye out for the issue though. Ooh, a new house! Fun! Wait, what? Two loads at once? That would be aaamazing! Those front load washers are very cool. I like the idea you can do something quickly with an extra small load in front if you need to. I will have to check this out when looking for a new washer.